Next PostYour Personalized Coachella Festival Guide Is Here. There’s a new widget in town. After carefully reviewing the feedback, comments, and questions from our artist community, our new events widget will be pushed live on all artist websites. This will make it easier than ever for fans to purchase tickets from your artists sites, an experience we’re always striving to make as seamless as possible. The best part? Your widget will automatically update in the next few hours—no action needed on your end! Replacing the “Tickets & More” button (which previously triggered a pop-up), the new widget now gives fans the option to RSVP or Buy Tickets directly on an artist’s website. While the RSVP button will direct users to the artist's Event Page on Bandsintown, the Ticket button will push fans to the official ticketing link. 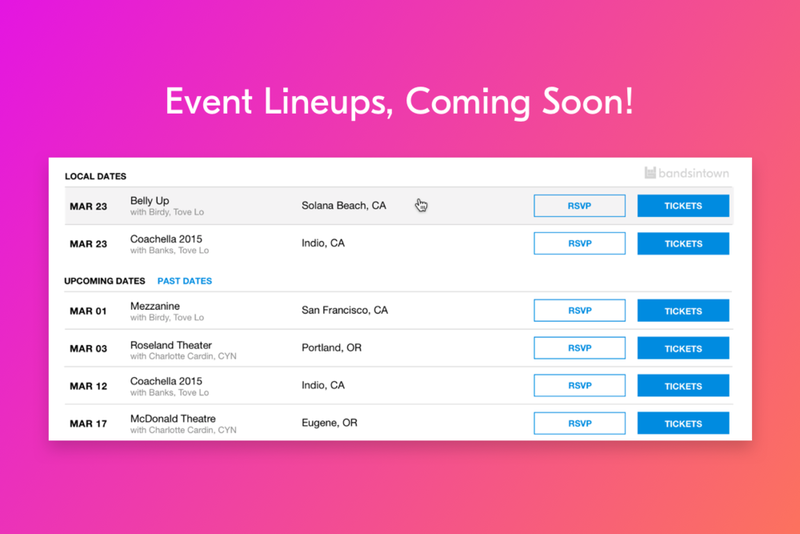 This both makes it easier to amp up the RSVP count for your artists' shows and sell more tickets. Two birds, one stone. In the top right hand corner of the widget, you’ll now see Bandsintown branding available on your artists’ widgets. This enables fans who visit your artists' websites to click out directly to their Artist Page on Bandsintown, meaning more Trackers for all! Branding will be turned on by default, but if you choose to forgo this update, there’s an option to opt-out. This setting can be changed using: data-display-logo=“false”. A new feature will soon be available for all widgets, allowing artists to display the full lineup for any given show. The lineup feature will be turned off by default, but if you choose to add it, there’s an option to include it on your artists’ sites. This setting can be changed using: data-display-lineup=“true”.